Our Executive Basket will please the whole office. We fill it with a superb selection of local fruit, such as shiny apples, juicy oranges, grapes, bananas and nectarines. We also include a gourmet selection of sausage, cheese, crackers, nuts, cookies, and chocolates. 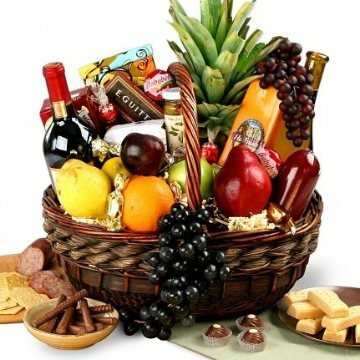 You may choose Chardonnay or Merlot to accompany this basket. Exact basket, fruit selection, and wine may vary by season and delivery location. Executive Wine, Fruit & Gourmet has been purchased most frequently by our customers for the following occasions: Christmas, Corporate Gifting, Thank You, Birthday, Sympathy, and Get Well.